Great wine and great guitars go together very well, and in that spirit, Gibson Brands and Osborne have joined forces to create a special guitar that will be on display at the Osborne Toro Museum in Spain. This guitar is like nothing before it. This is the first and only Gibson Custom electric guitar that has been handmade in centennial wood from the same wine cask used to age the fine wine from Bodegas Osborne. As the story goes, for more than a 100 years, Osborne has used this American oak to produce its wine. That same oak was recycled in the Gibson Custom factory in Nashville, Tennessee, to create this unique guitar, branded with the Osborne bull. The result is the stunning Gibson Custom Osborne SG. The SG, of course, is an iconic Gibson guitar that’s been used by everyone from Pete Townsend to Eric Clapton to Tony Iommi. The SG was a perfect fit, since it facilitated a design where the cutaways could replicate the horns of the Osborne Bull. The guitar – which also features 14-karat gold hardware – was officially presented on Sept. 23 at the roof top of Mercado de San Anton in Madrid. 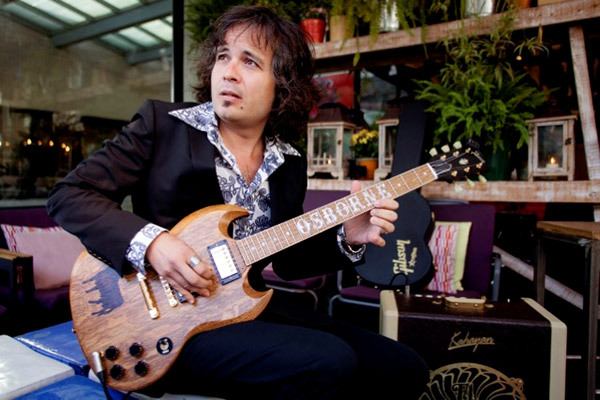 Latin Grammy winner Diego García “El Twanguero” rocked the guitar for the first time. The guitar will be on exhibit as part of the permanent collection at the Osborne Toro Museum at El Puerto de Santa María, Spain.